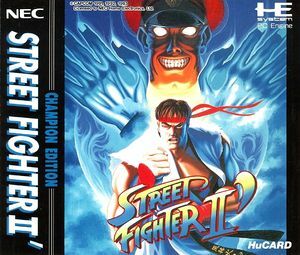 Street Fighter II': Champion Edition (ストリートファイターIIダッシュ -CHAMPION EDITION-) (sutorīto fuăitā II dasshu, Street Fighter II Dash), is a competitive fighting game. It was the first of several updated versions of the original Street Fighter II: The World Warrior. The main changes consisted of the addition of the Grand Masters (the final four computer-controlled opponents in the single-player mode) as playable characters and mirror matches (same character vs. matches). The fighting techniques of the eight main characters from the original game were also further refined to allowed for more balanced competitive play. Dolphin's aspect ratio settings must be explicitly set to 4:3 to display this title appropriately. Refer issue 10232. The graph below charts the compatibility with Street Fighter II': Champion Edition since Dolphin's 2.0 release, listing revisions only where a compatibility change occurred.